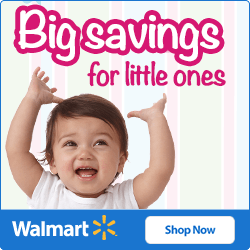 If you plan to take your baby on a road trip or vacation, you’re about to realize just how much essential baby gear you’ll need on a day-to-day basis. 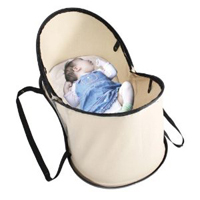 One of the most important items is something for the baby to sleep in, ideally a portable bassinet or travel crib. We’ve done the research to find and compile these portable travel crib reviews to help you find one that’s right for your baby. If you’re looking for something more permanent (to keep at the lakehouse or grandparents’ place), see our mini crib reviews. There are a few key features that I like to see in a good travel crib – these are the absolute essentials for something that (1) I plan to travel in a car or airplane with, and (2) would be suitable for my baby to sleep in. 1 Compact size for travel. Obviously you need something smaller than a full-size crib for travel, but even the standard pack-N-play is large and heavy for a single person to tote around. The smaller and more compact a travel is when folded, the better. 2 Safe and sturdy. It’s amazing how much baby gear I see that’s for sale in spite of clear safety issues. 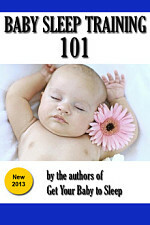 Anything that a baby sleeps in should be designed to allow air flow and have no choking/suffocation/overheating hazards. It also needs to be sturdy enough not to collapse when your baby is in it. 3 Space-saving when set up. When you’re traveling outside of the home, space is usually at a premium. Note just in the car or airplane, but in a hotel room or beach cabin or whatever. Your baby probably doesn’t need a full-size crib just to sleep for a few days, and you want something that won’t hog the whole room. 4 Lightweight and easy to carry. What I hate about most pack-N-plays is that they’re both heavy and unwieldy, with a single cloth handle that’s supposed to “conveniently” let me carry the thing by its midsection. Toting one of those through the airport is going to be a nightmare. Instead, I’m looking for something that can fit inside a suitcase or has a convenient, well-designed carrying case. 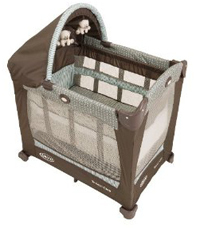 The Graco Travel Lite crib with stages is similar to a pack-N-play option with two important differences. First, its space-saving design makes it 20% smaller than your typical play yard. Second, it includes a bassinet with two height adjustments, to accommodate your growing newborn. There’s also a canopy to help block out the light, which is important when traveling (especially when you’re sharing a room). 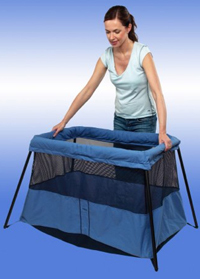 This travel crib also folds with the push of a button (visible on the side in the photo at left) into a compact, travel-friendly size. The quilted mattress pad keeps baby comfy and cozy when in the play yard. Overall this is a nice and travel-friendly option for your baby. The Kushies Easy Fold Baby Bed is a compact, folding baby bed that’s perfect for traveling. Made of a lightweight, UV-protective fabric, it folds easily and weighs less than four pounds. I really like the protective netting, which makes this the perfect option for taking your baby outdoors to picnics, the beach, a little league game, or wherever there could be biting bugs or over-curious strangers. The Phil & Ted’s Nest is another great option for traveling, overnights with the grandparents, or a nap at the park or beach. 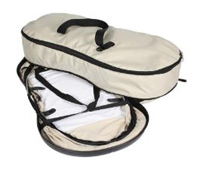 This is not just a sleeper: One side is spacious storage bag and the other side unzips a pop-up bassinet. So, you can stash some baby gear, clothes, blankets, or other essentials in the storage section. It also accommodates a fitted sheet (sold separately). The product description states that this will fit into an overhead compartment of an airplane. While this might be true, you won’t get the chance to find out because it exceeds the carry-on size allowance, so most airports in the US won’t let you carry it on. Set up and ready to use in one simple movement. The Babybjorn Travel Lite 2 is a new and improved version of their bestselling travel crib, with an improved leg mechanism that makes take-down even faster. 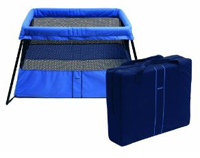 This travel crib has a uniquely compact design that features a base with slanting edges. This means the crib stands firmly and doesn’t wobble, even if little ones are standing up or if older siblings are leaning against it. 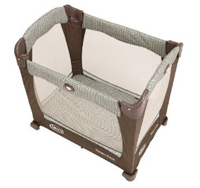 The see-through net fabric side panels let you keep an eye on the baby while he’s playing or sleeping. It also comes with a removable, waterproof cover, which helps protect against leaky diapers. 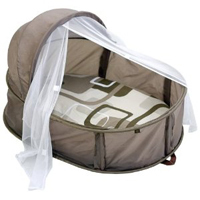 You can buy a Baby Bjorn Fitted Sheet that will keep this travel crib soft and cozy for your baby. Anti-Puncture materials maximize strength, stiffness, and prevent leaks. Curved sidewalls eliminate hard edges and corners to prevent unintended bonks and bumps. I saved one of the best for last: the GoCrib by Guava Family. This standard size, ultra-portable travel crib packs into a lightweight backpack for ultimate freedom. Set up is fast and simple with the included dual-action pump that inflates the crib in less than a minute. There’s a pressure gauge that tells you when the crib is ready to use. Once inflated, it’s the size of a regular play yard, with a nice zipper-down side to let you do some tummy time. Don’t think of this as a cheap blow-up crib. Just the opposite, the GoCrib is a rigid inflatable structure that creates a strong and safe environment for your baby anywhere you go. When it’s time to pack up, the valves lock open to make deflation a snap. And then it stuffs into a backpack like a sleeping bag would. The backpack is small enough to carry on, so you don’t have to worry about the airlines losing or damaging it. 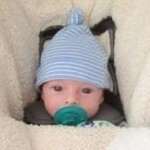 If you get the Graco, Baby Bjorn, or GoCrib travel crib, don’t forget to buy a fitted sheet. You can get the brand for most of these, but the Jersey Knit Porta-Crib Sheet by American Baby Company offers a nice alternative. These 100% cotton sheets are machine-washable, come in 5 different colors, and fit all standard size 24W x 38L porta/mini-crib pads.